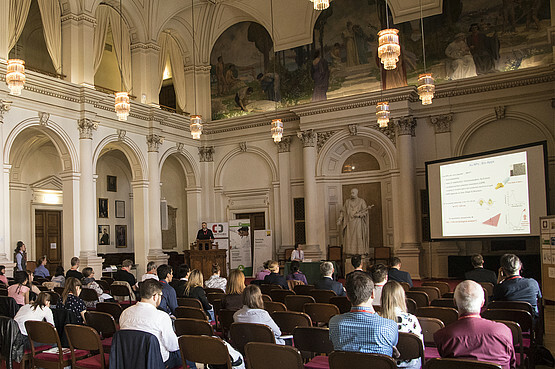 From April, 25 until April, 27, 2018 the 9th International BioNanoMed 2018 Congress „Nanotechnology in Biology & Medicine” took place at the University of Graz. Natural Sciences, Medical Sciences and Engineering Subjects throughout the world. Keynote Speaker were the renowned researchers Rogério Gaspar (University of Lisbon), Jesus M de la Fuente (CSIC-University of Zaragoza) and Alessandro Grattoni (The Houston Methodist Research Institute). Here you find some impressions of the event and the program. From April 9-11, 2018 the SFB LIPOTOX and BioTechMed-Graz organized the "7th International Symposium on Lipid and Membrane Biology". 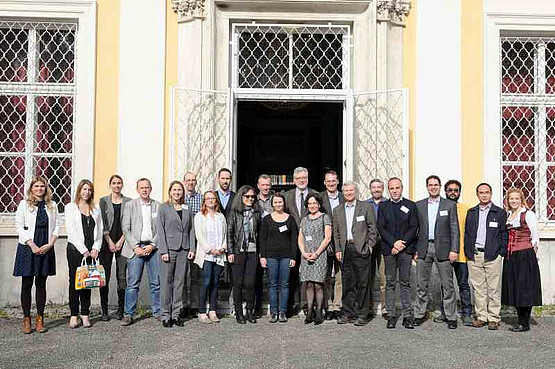 The symposium took place at the Meerscheinschlössl at the University of Graz. International scientists and experts in the field of Lipid and Membrane Biology attended the event. Here you find some impressions of the symposium and the program. From September 18, 2017 - September 22, 2017 the Institute of Neural Engineering invited BCI experts from more than 20 countries to the second largest international BCI Conference worldwide. In addition to a Hackathon for Brain-Computer-Interface Designers the first BCI Science Slam took place in Graz - a stage show that puts the spotlight on the entertaining side of science. Here you find further information on the BCI Conference. 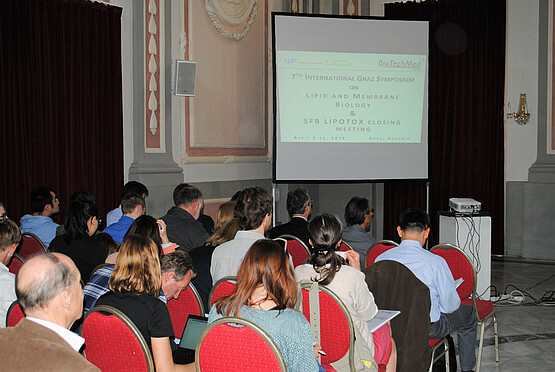 In collaboration with the SFB LIPOTOX, BioTechMed-Graz organized the 6th International Graz Symposium on Lipid and Membrane Biology. The event took place on April 7-9, 2016 at Meerscheinschlössl at the University of Graz. The line-up of speakers was very impressive and the BioTechMed-Graz keynote lecture 2016 was given by Prof. Sir Stephen O'Rahilly on April 7, 2016 on the topic “Obesity and insulin resistance: Lessons from human genetics“. On Thursday, June 11th 2015, the BioTechMed-Graz Symposium took place. Short presentations by the BioTechMed-Graz Postdocs gave an overview and specific insights into the inter-university projects and research areas within BioTechMed-Graz. The highlight of the evening was the keynote lecture on the topic “Wie beeinflussen unbewusste Reize Gehirn und Verhalten?” by the renowned neuroscientist, Prof. Dr. Arno Villringer (MPI for Human Cognitive and Brain Sciences, Leipzig). Prof. Marian David (Institute of Philosophy, Uni Graz), Prof. Robert Legenstein (Institute of Theoretical Computer Science, TU Graz) and Prof. Franz Fazekas (Division of General Neurology, Med Uni Graz) discussed the topic from different perspectives in the closing panel discussion. The evening finished off with further discussions in the closing get-together.